Sickly Bernice is a hypochondriac Breton and the proprietor of Sickly Bernice's Taphouse, the only place for beds, food and drinks in Crucible, New Sheoth. She is convinced she is dying from her imaginary illness and asks you to retrieve a very special and unique medicine during the quest A Liquid Solution. Surprisingly active for a person who is terminally ill, Bernice works 24 hours a day servicing her many regular customers. With only 5 gold and a Mercantile skill of 44, Bernice is not the obvious choice for a good deal and you will even have to listen to her complaints when bartering. She will buy your potions and food, while only selling the latter, including her own brand of wine, which comes in three different variants, the Summer Wine, the Roofwater Wine and the expensive Alley Wine. She can be found standing behind the counter for the majority of the day, although she will take a stroll around the taproom between 10pm and 4am. She wears red finery. She is armed with a shortsword and carries some gold. When you approach her for the first time, she make an attempt to sound service-minded, saying "Oh... hello." but talking to her will reveal her supposed illness: "Sickly Bernice, proprietor. Don't get too close now. You might catch what I have." After a false cough, you can ask her about her condition: "Well... it seems I am dying. Yes, these may be my last days in the Shivering Isles. That is, unless someone like yourself could help me find the cure. But no one has taken me up on my offer, even with the promise of a reward. Ah well, it's been a good life I suppose...." At this point, it is possible to rent a bed, barter with her, or simply exit the conversation, which will make her say: "Leaving me to die in peace, eh?" Talking to her again will make her greet you with: "Hello again... talk to me while you can. I don't think I've got too long." In any case, it is possible to make her elaborate on the supposed cure, which will make her ask: "Are you willing to help me?" If the answer is 'no', she will respect her fate: "Very well... you have doomed a frail woman to certain death...." If you say 'yes', she will explain what needs to be done: "Oh, thank you so much! There's only one place in all the Isles to get the cure for what I have... Knotty Bramble. I'll mark it on your map. There, on the lowest level of the place, is a pool containing the cure: aquanostrum. Legend has it that it bubbles up from around an old statue. Bring me back the remedy, and I will reward you well. Here, take this special flask to collect the aquanostrum." She will then hand you her empty flask and explain why the aquanostrum will be helpful: "Oh yes... it's the miracle remedy for any disease! I was told about this wonderful solution by a recent patron of my establishment. He said if I let him stay for free, he'd tell me how to cure my sickness! How fortuitous! Apparently it only exists at the bottom of Knotty Bramble... ah well. So close, yet so far." 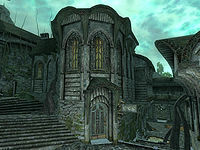 If you ask her about a cure with an empty flask in your inventory, Bernice will utter: "I see the flask is still empty. Nothing to do now but await my cold, lonely death." Finally, she will let you know that every minute counts: "Hurry! There's no telling how much time I have left!" When you return from Knotty Bramble with the Aquanostrum Flask, Bernice will eagerly say: "Please, tell me you have my remedy... I can't hold out much longer!" When you hand her the flask, she will temporarily forget her illness and hand you the reward: "Let me see. Yes! This is it! Please, accept this as a gesture of thanks. It's the least I can do for you... after all, you saved my life!" She will exit conversation with: "Take care. Wish I could." Approching her again will reveal that she is not cured at all: "So much to do. So little time left to do it." Unfortunately, Bernice suffers from hypochondria and cannot be cured. After a few days, talking to her will net you: "I'm sorry to trouble you again...but I think the cure has worn off. I feel the cold grasp of death sneaking up on me once more. Could you please get some more aquanostrum from Knotty Bramble for me?" If you deny her request she will cough and say: "Oh. Well, hopefully I'll still be alive by the time you change your mind." If you accept to take yet another trip to Knotty Bramble, she will hand you the empty flask once again and say: "You're too kind! Here is the empty flask again." Talking to her again will make her ask: "Did you bring back my aquanostrum?" If you still haven't collected her medicine, she will say: "Oh. Well, do hurry. I'm beginning to feel faint." If you try and hand her the empty flask, she will say: "You don't seem to have the bottle with you. Shame on you for lying to a sick woman." When you return from Knotty Bramble for the second time, Bernice will reward you with some gold and say: "Thank you so much again! Here is a small bit of change for your time." She will continue to ask you for more medicine indefinitely. Due to her many demented regulars, Bernice will also prove helpful during a few other quests; during the Lady of Paranoia, when you are investigating the behavior of Ma'zaddha the weak Bernice will quickly break after a bit of pain from Herdir: "Torturing a sickly old woman? Are you trying to kill me? I don't know anything, not for certain. I hear that Ma'zaddha has been seen talking to Syl's Guard Captain, Nelrene, but I haven't seen them. Not wise for me to be outside late at night; too easy to catch another cold. But if the rumors are true, you should keep an eye out for them. And leave me alone! I've got enough wrong with me already. Don't need new wounds to add to my troubles." 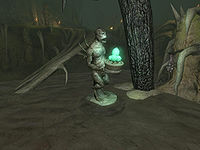 During the quest Ushnar's Terror, Bernice will provide some unusual information about another of her regulars, namely Ushnar gro-Shadborgob: "Yeah, he eats here. Terrified of cats though. His dog can be a terror. I once saw him sic it on a guy who tried to steal the dog's food. He told me the dog can smell its food on anyone. Ushnar let that dog tear that poor Khajiit apart." When asked about a room, Bernice will make you an offer with a piece of advice to go with it: "Sleepy, are you? Be careful, you might be ill. Or dying. You never know...If you insist on sleeping, there's a bed for 20 gold a night." If you decline, she will just say: "Fine. One less thing for me to clean up afterwards." If you accept, she will show you the way: "Very well. Go through that door up the stairs, and it'll be the first door on the right. Sleep well, if you can." If you ask her for a bed again, Bernice will be the first to admit her place is hazardous to your health: "You've got the best room I can offer. If you start feeling ill for any reason, please consider shortening your stay." I wouldn't be caught dead at Sickly Bernice's... though I imagine her customers might. Sickly Bernice is convinced she's dying. No wonder no one wants to eat at her Taphouse. Sickly Bernice in Crucible believes she is dying. Sickly Bernice's isn't a bad place. Just make sure to wash your hands. Sickly Bernice is always looking for a miracle cure. It's not a bad place, when Bernice feels up to cooking and cleaning. I understand she'll pay for a "cure" for her malady. I hear she will pay for a "cure" for her latest disease. If at Sickly Bernice's Taphouse you wish to drink, take a moment to stop and think. In Crucible lives poor Bernice, she's sick I think you'll find. But is it really illness, or is it all just in her mind? Bernice is one of the few merchants with unique dialogue while bartering; as expected, she will take the opportunity to complain about her imaginary disease and will randomly utter: "I've got food and drink, if you need it. I haven't touched it much, so it should be safe. Might want to wipe it off first anyway. You never know. ", "Good food helps keep you healthy. For most people, anyway. Doesn't seem to work for me." or "Eat well, while you have your health. I'm sure I have something that would interest you." If you buy any of her foodstuff, she will say: "I hope you enjoy it. I can't seem to taste anything these days." and "Thank you. The funds go toward my home remedies." After bartering, she may say: "Thank you for stopping by. Stay healthy." Someone different come to the Isles? Don't like to think what kind of diseases came along. The Gatekeeper has died. Wonder what got him. Collywobbles? Greenspore? The Resonator is active once again? Perhaps it will draw the disease from my body. How can Thadon drink from that Chalice? Who knows what germs are on it? I heard something strange happened in the House of Dementia. Probably disease-related. Syl is gone, and a new ruler presides over the House of Dementia. Perhaps they can cure my malady. Thadon has passed the mantle. I heard he was in bad health, anyway, and I know how that is. Order has attacked Passwall. Probably brought horrible disease with them, as well. A new Gatekeeper protects the Fringe. But he does nothing to stop the spread of disease. The Daedric armies are whole again. If only I could live to see them in battle. The chills are getting worse, though. Sheogorath gone, and me not far behind. I think this cold will finally be the death of me. Order is defeated! I think I actually feel a little better. No... I don't. Sickly Bernice is actually very healthy: she is marked as essential and therefore will never die, whether or not you complete the related quest. As a result, her gravestone in the New Sheoth Graveyard stating "This time, she was right." will never be seen in game. 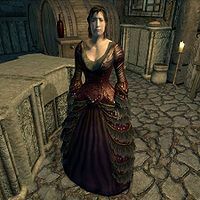 Bernice was supposed to greet you differently upon completion of the Main Quest; unfortunately, as her demand for medicine never ends, the recorded dialogue for Sheogorath is never heard: "Lord Sheogorath, your presence alone makes me feel more healthy." and "I hope I live to speak with you again, Lord Sheogorath."